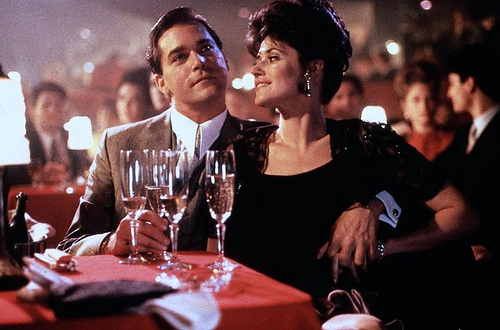 Based on the true story of New York mafia gangster Henry Hill, GoodFellas is a sprawling, entertaining epic that covers three decades in the lives of colourful criminals. While GoodFellas lacks the gravitas of The Godfather, it makes up for it with irresistible personality. It's 1955, and teenager Henry Hill (Ray Liotta) is growing up in Brooklyn, living in an apartment across the street from a taxi office that in reality is a front for mob boss Paulie (Paul Sorvino). Henry is excited by the prestige and wealth of the mobsters, and over the years he graduates from doing odd-jobs for Paulie's crew to participating in crimes, and grows into the role of a wise guy in Paulie's inner circle. 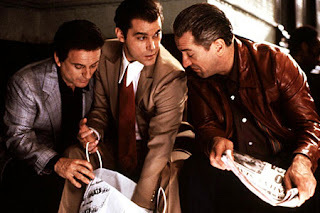 Other criminals with emerging reputations rotating around Paulie include Jimmy Conway (Robert De Niro) and Tommy DeVito (Joe Pesci). Jimmy is smooth, calm, and viscous when needed. Tommy is loud, unhinged and volatile, capable of switching from funny to deadly in an instant. Henry ultimately proves his value by helping to plan and flawlessly execute the theft of a large amount of money from an Air France office. He moves into the big time of flashy cars and slick clothes, gets married to Karen (Lorraine Bracco), and is quickly cheating on her with barely discreet mistresses. While the life of crime seems to have few downsides, trouble is lurking. Tommy's temper is out of control, and in 1970 he kills a made man, usually considered untouchable, from the Gambino family. And when a shakedown in Florida goes wrong, Henry is sent to jail. Upon his release and with his lifestyle threatened, he becomes a full-fledged drug dealer, despite Paulie's warning not to. With drug money rolling in and now himself an addict, Henry is quickly back to the big time. In 1978 Jimmy, Tommy, Henry and many other men from Paulie's crew pull-off a multi-million dollar robbery of a Lufthansa office, but the enormous amounts of money cause stress between the men, and they turn on each other. 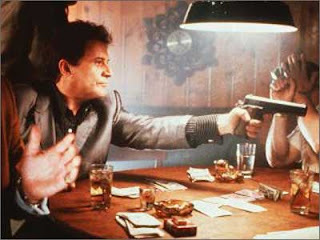 Jimmy starts a clean-up operation, eliminating most of the participants in the Lufthansa heist. Tommy is killed in a hit arranged by the Gambinos. And in 1980 anti-narcotics agents finally catch up with Henry's drug operations, forcing him to make a choice between certain death and full disclosure. While The Godfather series focused on the upper echelons of mobster families, GoodFellas takes us to the street level, and to the lives of the wannabe men who do the dirty work while wearing expensive clothes. It's an engrossing movie, filled with rich characters, memorable scenes, comedy, drama and violence in perfect balance. Despite being based on real people, the three main characters in GoodFellas are all larger than life. Relatively unknown at the time of filming, Ray Liotta captures the centre of the film with an affecting performance as Henry Hill, on a remarkable journey from wide-eyed hanger-on to a wild-eyed, drug-addicted desperate mobster. Robert De Niro is surprisingly and effectively controlled as the scheming Jimmy, who emerges as the most calculating member of Paulie's gang. And Joe Pesci gives a most memorably stunning performance as Tommy, a hypnotic package of dynamite that may explode at anyone, anytime and for any reason. It's impossible to ignore Pesci when he's on the screen, as in every scene he's either already in the centre of the action or about to make sure that he creates a maelstrom around him. Scorsese directs with an emphasis on continuous kinetic energy, and his use of freeze-frames is terrific, but unfortunately limited to the earlier scenes. His screenplay, co-written with Nicolas Pileggi and based on Pileggi's book, keeps the action humming for 146 minutes of running time, while squeezing in as many F-bombs as possible. Despite lives drenched in crime, GoodFellas succeeds in presenting Henry, Jimmy and Tommy as characters who would be thoroughly entertaining to invite for dinner. Whether anyone lives to finish the meal would be entirely up to Tommy.